I want to give you some idea of what you can realistically expect when housebreaking your dog. How fast this program can work depends on many factors. An excitable puppy will take longer than a laid-back one. Housebreaking in a busy household in which chaos rules is harder than in a quiet one on a regular schedule. And an older dog with a well-established habit of relieving himself inside will take longer than a puppy or an older dog who has been previously kept outside. If you start with a 7- to 12-week-old puppy and follow the above program religiously, you may be able to limit the number of accidents in your house to three or four times per week. However, if your puppy is under four months old, it is to be expected that he will sometimes lose control of his bladder when he gets excited. If you are following this program and after three weeks are having more than a few accidents a week, you are probably doing something wrong. Check the troubleshooting list at the end of this chapter, and reread the chapter. Your dog should be completely housebroken by the time he is six months old. By completely housebroken I mean able to be taken with complete confidence to visit your mother-in-law who is not very fond of dogs and has expensive Oriental carpets. If you feel your dog is not progressing fast enough in his housebreaking, seek the help of a professional dog trainer who counsels clients about this problem. 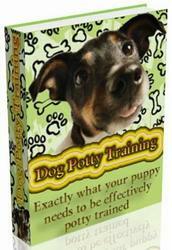 The longer your dog continues to relieve himself in the house, the harder it will be to housebreak him. Don't wait too long!